"The government claims that based on data provided by Germany, it isn't feasible to locate people and assist drones in guiding missiles to their targets. Former U.S. drone operator Brandon Bryant said, however, that a mobile phone number is sufficient to kill a person – and Germany supplies mobile phone numbers. … The Bundestag's NSA Investigative Committee has been probing the 'hows' of surveillance conducted by the BND and NSA for nearly two years now. … With Bryant, Committee members had to deal for the first time with the deadly consequences of this data collection. … 'German history illustrates the path my country is now taking,' said Bryant." 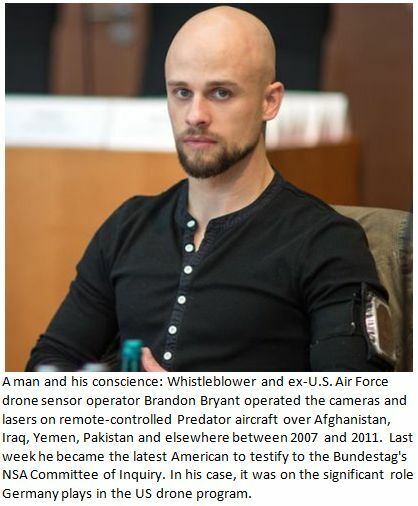 U.S. drone operator Brandon Bryant is a key witness before the [Bundestag] NSA Investigative Committee on the deadly consequences of metadata collection - and Germany’s critical role in it. Bald, bearded, with tattooed arms and a T-shirt – Brandon Bryant appears out of place among the people in suits of the German Bundestag. On Thursday he testified before the NSA Committee [of Inquiry] about his earlier work with the U.S. Air Force, including his day-long observations from the air and killing people with Hellfire missiles; the "manhunt," as he called it. But it wasn't only Bryant's appearance that set him apart from the others in the hearing room. It was if reality were bursting forth into what is otherwise theoretical debate on surveillance and selectors, antennae signals and those who carry them. The 29-year-old Bryant was at the receiving end of all that government-collected data. He was the one to pull the trigger, making sure that missiles hit preselected targets identified through the use of secret service-collected surveillance. For five years and five days, Brandon Bryant was a drone operator for the American Air Force. As a staff sergeant, he coordinated combat missions in Iraq, Afghanistan, Pakistan, Somalia and Yemen. During these missions he operated the cameras of a Predator drone and guided its laser, ensuring that its hellfire missiles hit their targets. Bryant is a star witness for a sentence once uttered by former NSA Chief Michael Hayden, "We kill people based on metadata [watch below]." Metadata, the data left behind by digital communications, are not harmless. Nor is the data collected and sent to the United States by the German intelligence services. To fire a missile at a home, he said that for the United States, locating a "wanted" mobile phone within is sufficient justification. And he described that aboard these drones there is a system called "Gilgamesh" that operates like a mobile phone tower used to pinpoint phones on the ground [video, right]. As to whether data supplied by Germany was used, his reply to a question posed by Left Party Chairwoman Martina Renner was brief: "Yes." The German federal government vehemently denies that such a thing is possible. Based on the data the Office for the Protection of the Constitution and the Bundesnachrichtendienst [BND] supplies to the United States, the government claims that it isn't feasible to locate people and assist drones in guiding missiles to their targets. Bryant said, however, that a mobile phone number is sufficient to kill a person – and Germany supplies mobile phone numbers. The Bundestag's NSA Investigative Committee has been probing the "hows" of surveillance conducted by the BND and NSA for nearly two years now. Who knew what, when, and which systems collect which data? With Bryant, Committee members had to deal for the first time with the deadly consequences of this data collection. Bryant left the U.S. Air Force drone program because he no longer wanted to kill. Since then he's been fighting this form of warfare – for which he said Germany was America’s closest and most important ally; and Allies had a duty to protect one another when confronted with mistakes and bad decision making. His was an invitation to Germany to stop helping the United States kill. For as the questioning clearly showed - Germany is no innocent. 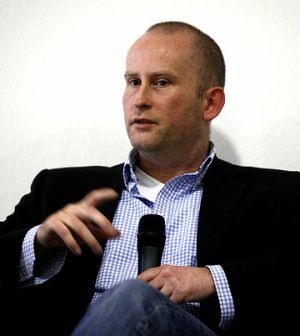 Bryant described, inter alia, the importance to America's drone war of Ramstein Air Force Base in Germany’s Eifel region. That's nothing new. Two journalists have written an entire book on the subject. Yet there is a difference when you hear from an eye-witness that there would be no American drone strikes in Africa without Ramstein. According to Bryant, this was no secret to the German federal government. He was regularly told that nothing there was being done without the knowledge of the German government - Berlin was informed of everything. So far, the government denies this although there is clear evidence that its claims of ignorance cannot be true. Something else distinguishes Bryant from all others who've appeared before the NSA Investigative Committee before: He takes responsibility for his actions and doesn't try to justify them. Bryant flew combat drones for over 6,000 hours during missions in which 1,626 people were killed. He got out because he no longer wanted to kill and because he lives with the knowledge of having done something bad for a long period of time. Bryant is informing us in an attempt to educate and have this type of combat - combat Germany participates in - terminated. "I take responsibility for what I’ve done, and I am trying to hold my country accountable," Bryant said. No witnesses before him had this attitude. Some felt uncomfortable when questioned by Committee members, but none expressed such self-doubt about his or her own actions. Perhaps they should do so occasionally. "German history illustrates the path my country is now taking," said Bryant.